Beginning with the 2013 model year, a new car window sticker--called a "monroney" in the trade--will be required by the Environmental Protection Agency and the Department of Transportation. The new sticker design will display the same fuel economy information but with a different emphasis and add new data based on new assumptions. The new window sticker--called a "Monroney" in the trade after Senator "Mike" Monroney and in 1957 originally intended to give car buyers a "manufacturer's suggested retail price"--will now, according to a heavily politicized explanation by the EPA, "for the first time ever, highlight the increased efficiency standards achieved under the Obama Administration that will save families money at the pump starting this year." The new sticker will emphasize the combined fuel economy rating, rather than the current city/highway numbers which will still be shown but a smaller font. The new sticker will also provide comparable data to compare gasoline-fueled vehicles against all-electric and alternative fuel vehicles--which the EPA calls "next generation", such as those powered by natural gas. All-electric and plug-in hybrids will get new window stickers of their own with similar data but different calculations based on different assumptions. A new feature will be a European-style fuel consumption rating. Instead of miles per gallon, which assumes a certain amount of resource and measures how far one can go with it, the new rating is calculated in gallons per 100 miles (similar to the European liters per 100 kilometers), which assumes a limited distance and computes how little resources it will take to accomplish it. The new labels will also highlight so-called "greenhouse gas" (CO2) emissions and smog emissions. The current label already has an "Environmental Performance" section with a "global warming score" and a "smog score". The new sticker further highlights the "scores" by integrating them into the main body of the display rather than as an add-on. Like the old sticker, the new sticker announces, "Vehicle emissions are a primary contributor to global warming and smog," even though global warming has been replaced by "climate change" and the anthropogenic element remains controversial. 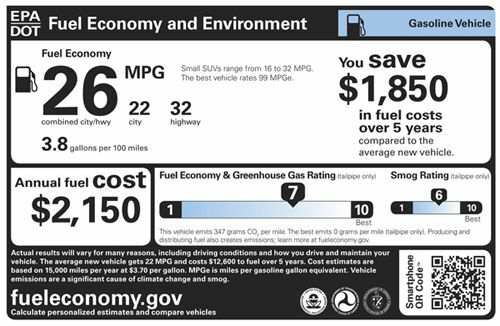 All stickers will have, in large print, the calculated savings or cost of driving the vehicle compared to the average new vehicle over a five year period. The change is that under the current rules, vehicles are compared only against a like vehicles in the same class, such as "all SUVs" or "all mid-size cars". The new EPA rules compare a sub-compact car versus an SUV, apparently assuming that the two classes of vehicles are interchangeable. All 2013 models must display the new window sticker, though manufacturers may elect to use it beginning in the 2012 model year. For more information, visit the EPA fuel economy site, http://www.fueleconomy.gov/feg/label/index.shtml. I applaud the Democrats for this history making EPA guidelines in which the Republicans sat on their asses for the past two decades denying we have "climate change." 15-20 years ago the Republicans along with the auto companies made complaints re new technolgies such as hybrids electrics natural gas and fuel cells would make the cars too expensive for we the public. Alongs comes the Prius at $20k somewhat pricey in the beginning but 50 mpg. And today look at the number of hybrids and electrics.....we are heading in the right direction and the modern muscle car will continue and maybe with two 140 hp front wheel drive electric motors and a 500 hp gas hybrid engine with 0-60 times under 4 seconds wow....I was just looking at a Lincoln MKZ hybrid and its priced the same as the gas version at $35k loaded and its EPA rated 41 mpg city. We can and will continue on this road to more efficient vehicles and wiser we the public.